Mayureshwar Temple is the first Ganesha Temple to be visited during the Ashta Vinayaka Temples Pilgrimage according to Shastras.It is near the river Karha in Morgaon village,which is about 64 km south-east of Pune, Maharashtra,India. Mayureshwar,in sitting posture,has three eyes and is facing east with the trunk turned on left.Diamonds are placed in the eyes and naval.The Nagaraj (King of Snakes) is seen on the head of the deity.On either sides,are the brass idols of Siddhi (Capability) and Buddhi (Intelligence). Mayureshwar.Mooshak (Rat) and Mayur (peacock) stand in front of the idol. It is beleived that Lord Brahma consecrated the original small idol, made up of sand,iron and diamonds.This was enclosed in a copper sheet by the Pandavas of Mahabharata and placed behind the idol which is now worshiped. The 'Nagnabhairava' idol on the left side of the main deity is worshipped first and is offered coconut andjoggery. Demon Sindhu, who was very powerful devotee of Lord Surya (the Sun God),attacked the gods and trapped them.On request from gods,Lord Ganesha appeared on Earth on a peacock and destroyed the Demon.This is the place where the head of Demon Sindhu fell down. 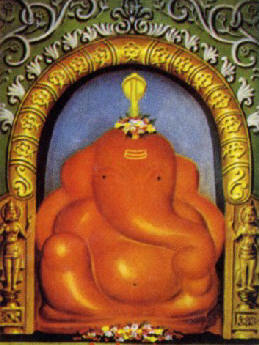 Hence,Lord Ganesh assumed the name Mayureshwar or Moreshwar. Moregaon Mayureshwar Temple faces towards the north and is in the center of Morgaon village. There existed lot of peacocks in this village in olden times and the village has a shape of a peacock,therefore it is named as Morgaon, "Mor" the name of the bird peacock.